shastaind.com - Polymers for controlled release formulation follows function: by focusing on pharmaceutical formulator's needs and keeping a close eye on changes in drug-release technologies, polymer scientists are providing products of better excipient quality and increased functionality. Polymers for controlled release formulation follows function: by focusing on pharmaceutical formulator's needs and keeping a close eye on changes in drug-release technologies, polymer scientists are providing products of better excipient quality and increased functionality. Once considered mainly an afterthought in a company's lifecyde-management strategy, controlled-release dosage forms are now positioned at the forefront of many formulation strategies. In contrast to drug discovery, formulation work focuses not only on the intricacies of the active pharmaceutical ingredient (API), but also on fine-tuning the excipients, the release profile, and the delivery mechanism to provide optimal therapeutic benefit. Because of their wide range of applications and functionalities, especially in controlled-release therapies, polymers are among the most widely used excipients. Polymers, and all other excipients, are selected on the basis of the controlled-release formulation as well as the delivery mechanism (e.g., enteric or parenteral dosage form). Because their business depends heavily on keeping current on demands and trends within the pharmaceutical industry, polymer makers are keenly aware of the factors that drive their clients' decisions. First, and most important, the physicochemical properties of the API and how it can be most effectively absorbed by the body are taken into account. Those particular properties will naturally lend themselves to one or two technologies. Formulators are particularly interested in determining whether the API displays instability, where in the body it has maximum stability, and whether a targeted delivery will be possible. In some cases, a controlled-release formulation is the only solution. The strength of the pharmaceutical company's expertise and capabilities also is a key decision point. Some companies have internal expert teams and dedicated equipment for tablet coating, for example. Each company is equipped to do what has worked for it in the past and what capabilities it performs the best, and most firms prefer to stay within their areas of expertise. Some actives get shelved because the dosing regimen is not convenient, so patient compliance must be taken into account. In addition, patient demographics and the targeted disease contribute to the type of controlled-release that will be necessary. For example, arthritic patients often experience pain in the early morning hours. For bed-time dosing, they may require a formulation that has no release for a period of time and then 100% release for 30-45 minutes, thereby necessitating a pulsed release. In some cases, a company's marketing department may still have a lot of say in the type of drug-release to be formulated to meet lifecycle-management needs. "That mindset is shifting," says Tim Cabelka, senior product research specialist at Dow's WSP Pharmaceutical Excipients R&D (Midland, MI). "Perhaps 15 to 20 years ago, a controlled-release dosage form may have been almost a second thought. Now the industry is taking a much more rational approach by looking at the pharmacokinetics of the drug, the dose level, where the drug is absorbed in the gastrointestinal tract, and the half-life in the body, and so on--all in addition to their lifecycle management concerns. There is a lot more scrutiny today. There has to be a pharmacological benefit for putting it into a controlled-release dosage form." A polymer's unique characteristics can help realize such pharmacological benefits. "When formulators choose a polymer, they are looking for the functionality and the physical and chemical properties of that polymer. The basis for that is going to be the chemistry of the polymer" says Nasser Nyamweya, PhD, technical services manager, Degussa Rohm Pharma Polymers (Piscataway, NJ). Although the choice is determined mainly on a case-by-case basis for each API, "very rarely will you find a drug that is not compatible with a general class of polymers," says Ketan Mehta, PhD, business manager, Degussa. Two criteria are that the chemistry of the polymer must not compromise the therapeutic action of the active ingredient and that the physical properties of the polymer must be consistent and reproducible from batch to batch. After these criteria have been met, formulators focus on the polymer's specific properties. Polymer properties. A polymer's chemical and physical characteristics are determined mainly by its average molecular weight and chemical structure (i.e., the functional groups attached to its backbone). Smaller sized polymers are suitable for formulation coatings and as co-solvents. Higher molecular weight polymers are covalently attached to pharmaceutical actives (e.g., polymers for pegylation). In addition, polymers can have various architectures, shapes, and linkers. The architecture can be one-dimensional (threads), two-dimensional (sheets), or three-dimensional (networks). The shape of a three-dimensional configuration can vary as well. For example, poly(ethylene glycols) (PEGs) used for biopharmaceuticals can be straight chains, branched, or forked. Some types of drugs work better with certain classes of polymers. Fragmented antibodies, for example, work well with forked PEGs. A straight-chain molecule can have the active group on one end or both ends, and those active groups can be the same or different. Polymers used as excipients or in biodegradable implants may contain ionic groups, in which case the polymer may be pH dependent. Biodegradable polymers (e.g., polylactides, polyglycolides, and poly(lactide-co-glycolides) [PLGAs]) are commonly used for controlled release from microspheres (for parenteral routes), from polymeric micelles, and implantable drug-device systems. Depending on the release mechanism, a polymer's pH also may be an important property. When drug is to be delivered at a particular pH to allow targeted release (e.g., in the gastrointestinal tract or in the colon), nonionic polymers can't be used because they are pH independent. 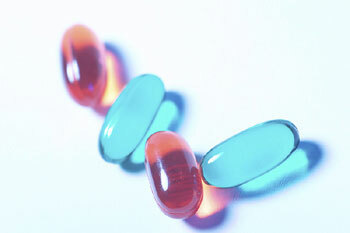 For some coated tablets, the pH is neutral to prevent interaction between the polymer and the drug. In other applications, the release takes advantage of the natural pH changes of the body to deposit the drug in a general area of the gastrointestinal tract. Oral dosage forms. In general, drug release occurs by erosion, diffusion through a membrane, or diffusion after matrix swelling. In many cases, the drug must partition into a polymeric membrane and then diffuse through the membrane to reach the dissolution media. The coating polymer may be water insoluble, and the solubility of drug in the membrane gives rise to the driving force of diffusion. The material may also be either partially soluble in water or a mixture of water-soluble and water-insoluble polymers. The water-soluble polymer then dissolves out of the film, creating small channels through which the drug can diffuse. Most often, controlled release from tablets is achieved by coating tablets or beads or by configuring drug-polymer matrix coated tablets (see Figures 1 and 2). The traditional type of coating for modifying drug release is an enteric, pH-dependent coating that delays the release until reaching the appropriate pH environment. For coated tablets, important polymer characteristics include elasticity, stability, and the ability to control moisture penetration of the tablet. Bilayered coating (i.e., one coating on top of another) also can be used to achieve sustained or controlled release. Depending on the active ingredient, if the thickness of the polymer membrane is constant, then the release is constant under ideal conditions. A topcoat of a water-soluble polymer such as hydroxypropyl methylcellulose can be used to produce smoother tablet surfaces and harder tablets without compromising dissolution times (1). One polymer-coating agent requires little or no plasticizer (Kollicoat SR 30D, BASF, Ledgewood, NJ) because of the high flexibility of the polymer (see Figure 3). Povidone is incorporated into the coating dispersion as a stabilizer. Povidone is highly soluble in water, and when the tablet comes into contact with the dissolution media, it dissolves and acts as a pore-forming agent. The drug dissolves and diffuses out through the pores at a controlled rate, leaving an empty polymer shell. A hydrophilic, swellable polymer matrix releases the drug through a polymeric hydrogel pathway, thereby enabling sustained release of the drug. In contrast, hydrophobic polymeric matrices do not swell, therefore the modified release is by Fickian diffusion. In turn, when Fickian diffusion controls the release, the drug's solubility affects the release (highly soluble drugs release at a faster rate).